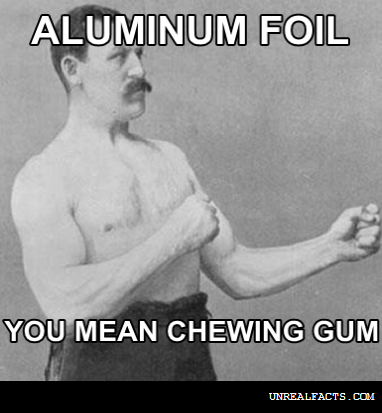 Why Does Chewing Aluminum Foil Hurt? Why does chewing foil hurt? Specifically, why does chewing, or biting down on aluminum foil hurt? 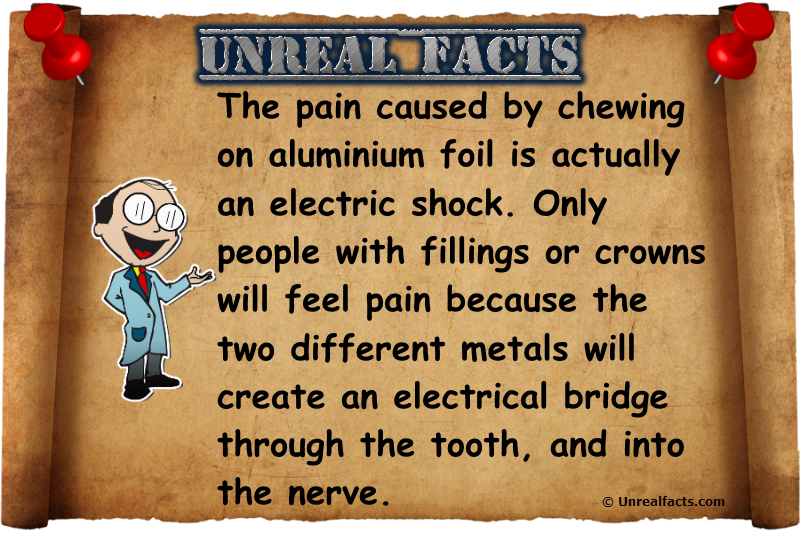 Surprisingly, the pain caused by chewing or biting down on aluminum foil is caused by an electric shock. It’s weird, I know, but it does make perfect sense. We have all been there and felt the pain. Just as with any tooth ache, the pain caused by the tin foil can be excruciating. But here is the cool thing. Not everyone will feel the pain, and once you understand why it hurts to bite aluminum foil, you will know the reason that some people can do it all day long it complete bliss. OK, we will set up the scenario. You and a friend have just accepted a dare. The challenge is to chew on some tin foil. You know that this is going to be a painful affair, but not wanting to appear weak, you proceed. The moment you begin to bite down the pain is instant and awful. But your friend appears to be nonetheless concerned. It’s as if he remains unhurt from the ordeal. How could this be? Why is it that you feel sop much pain when chewing aluminum foil, but your friend doesn’t? You got an electric shock, your friend didn’t. Let’s explain. How do we get an electric shock from chewing aluminum foil, and why does it hurt? You will only ever feel pain from chewing foil if you have had dental work done, and the reason is metal. People who have had some dental work done and have fillings or crowns will feel pain. When you bite down on the aluminum foil a charge is built up between two different metals. Normally people who have fillings or crowns have mercury or gold in the teeth. The difference between the two metals (foil and filling), mixed with a salty and moist mouth cause a electrochemical potential difference. The electrical charge is on the way. The electric shock travels from the foil into the filling or crown, and then into the nerve. The shock is then sent to the brain as a pain sensation, because that’s what it is, pain. The final step in the process is to remove the foil and NEVER do it again. The reason your friend didn’t feel any pain is because they more than likely haven’t had any dental work done in the way of fillings or crowns. Essentially, if your mouth is in perfect condition and has never been touched by a dentist, you will feel no pain from chewing aluminum foil.